Wouldn't life be just a little simpler if you could plug your phone right into the wall with just a USB cable? Actually, you can. 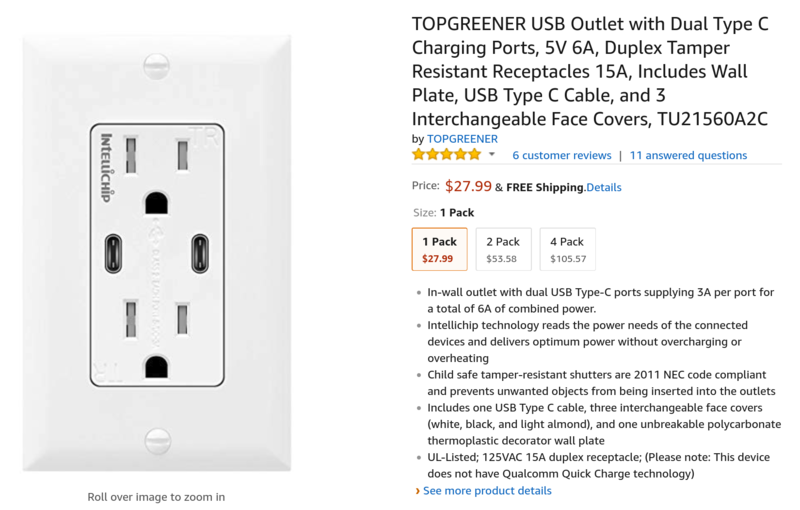 If you're about that kind of convenience, here's a deal for you: Topgreener's dual USB-C wall outlet is currently $27.99 on Amazon, down from its historical price of $34.99 — a hearty discount of $7. You can get an even deeper discount if you opt for a two- or four-pack, which are $53.58 and $105.57, respectively. Each outlet sports two USB ports and comes with swappable face plates to match your wall color. The ports on the outlets each put out 15 watts, which should charge your devices at a respectable rate. It's probably not quite as much juice as the charger that came with your phone — the Pixel 2's charger, for example, is 18 watts — but it ought to be close. Just don't expect to top up your MacBook Pro while you're editing video. Amazon doesn't show the new lower price as a sale, but it's lower than what Topgreener is charging for the outlets on its own website. If you're a handy type with a lot of USB-C gadgets plugging up your outlets, jump on this one.